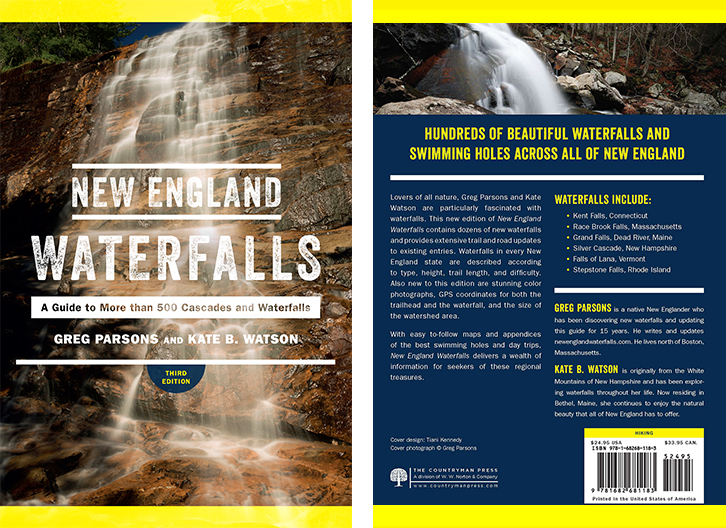 Imagine a mile-long stretch of a brook with several named waterfalls and dozens of large, unnamed cascades. 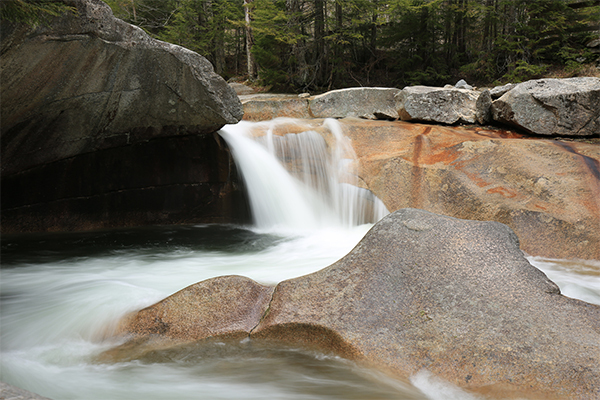 This is Cascade Brook as seen from the Basin-Cascades Trail. 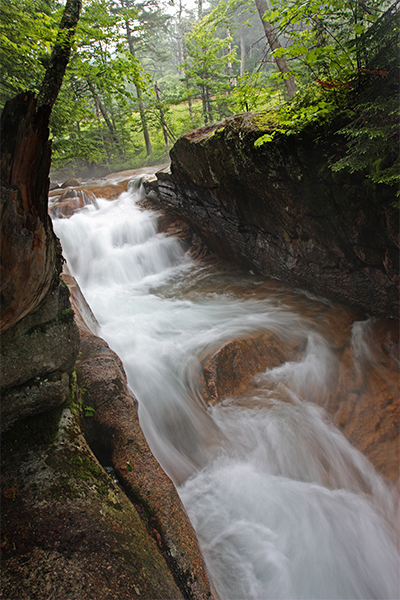 Over a stretch about one mile in length, the wide brook drops a total of six hundred vertical feet. 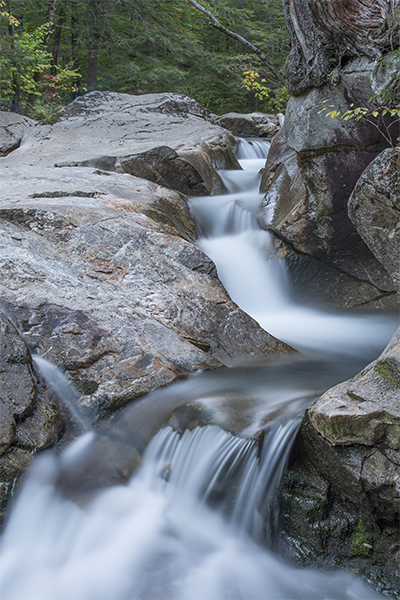 Even though the trail that runs parallel to the brook is one of the most popular in the White Mountains region, there are enough sun-exposed cataracts, cascades, and slides for everyone to be able to claim themselves a private spot for hours. 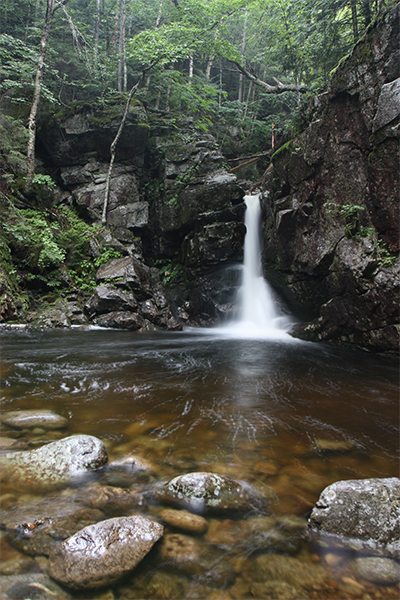 The major tourist-drawing feature is a small waterfall located in “The Basin” along the Pemigewasset River. 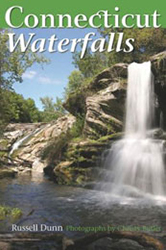 Only a few feet tall, this small falls travels sideways through narrow chute into a deep whirlpool. 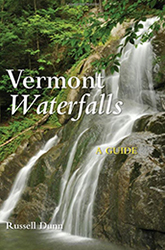 There is almost always at least one visitor to the falls at the Basin during all hours of sunlight. This high visitation is far from surprising, as access to the Basin could not be easier. 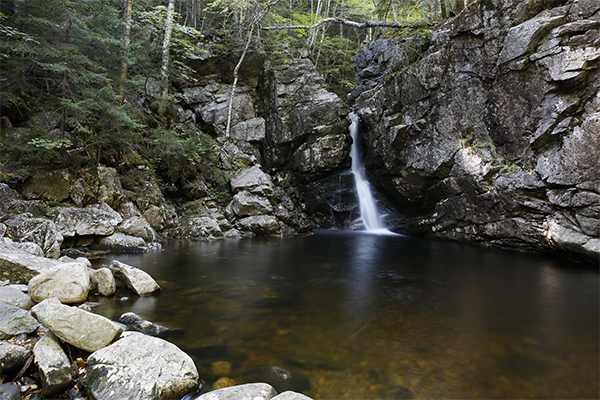 The area is marked by large signs on a major interstate, there is ample parking, and it is located just south of the other tourist-crazed features of Franconia Notch State Park, such as The Flume and Cannon Mountain. 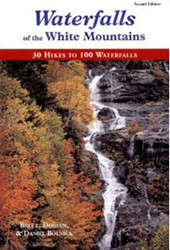 Kinsman Falls, Rocky Glen Falls, and a mile of the Basin-Cascades Trail lie beyond the waterfall at the Basin. 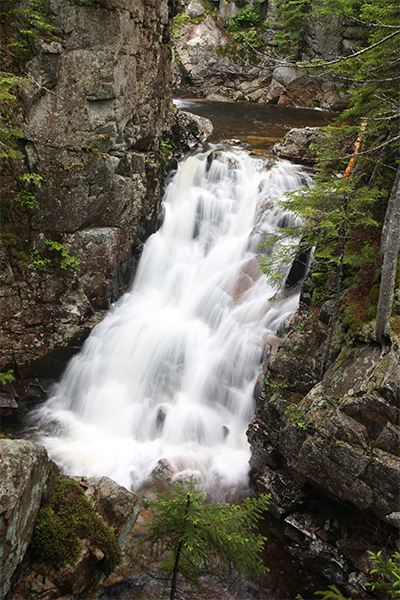 Kinsman Falls, a narrow 15-foot plunge into a swimmable pool, is the first officially named waterfall of the Basin-Cascades Trail. 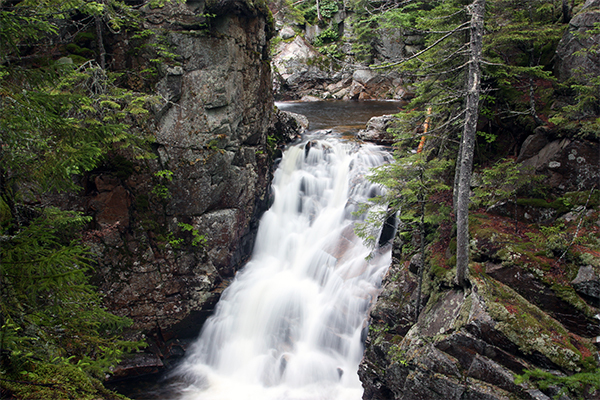 Before Kinsman Falls, the trail is blessed with unnamed cascades and plunges, many worthy of their own name and recognition. 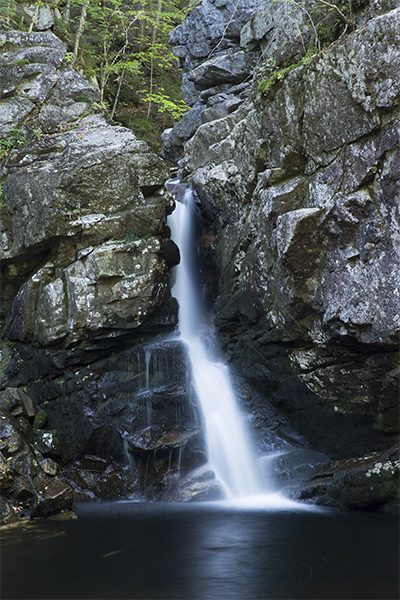 Rocky Glen Falls is the final waterfall along the Basin-Cascades Trail. 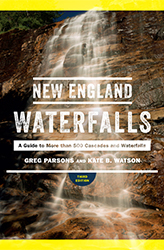 Here, Cascade Brook falls roughly 35-feet over two segments of jagged steps between narrow gorge walls into deep, yellow-colored pools. 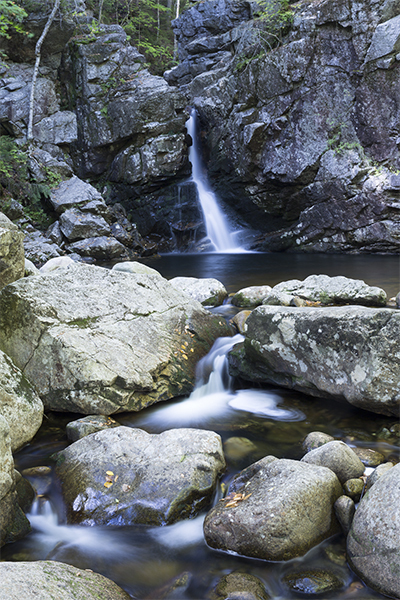 Of all the falls along this trip, Rocky Glen Falls is perhaps the finest. 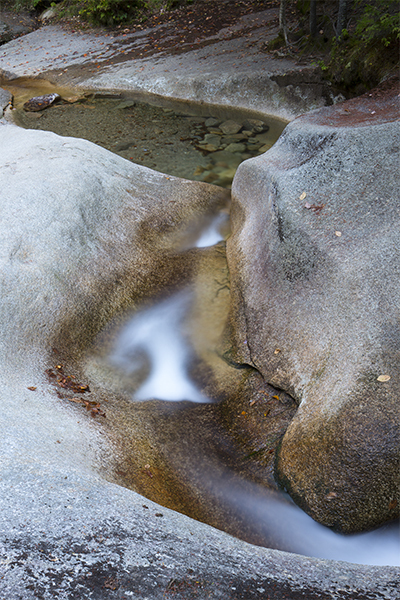 A short distance downstream of The Basin is the Baby Flume. 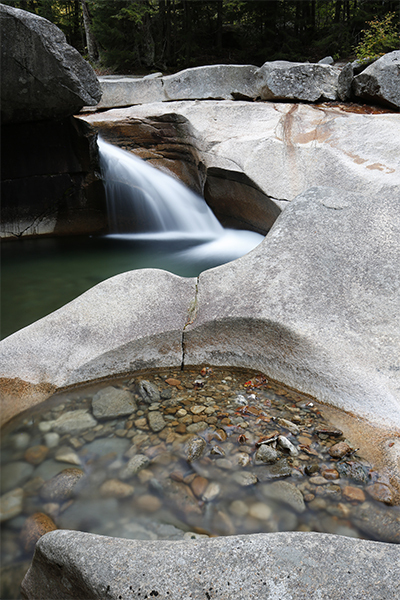 This 6-foot waterfall splashes its way through a narrow and short but attractive flume. 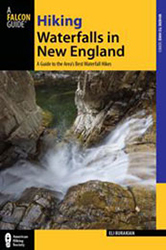 In previous editions of this guide, hiking to Lonesome Lake from the Basin-Cascades Trail was recommended. 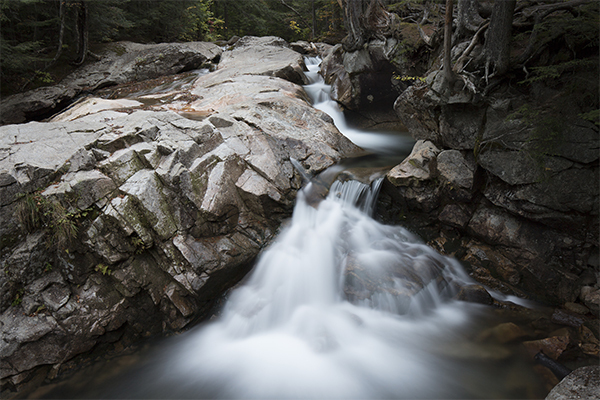 However, a bridge that previously existed above Rocky Glen Falls was destroyed and is unlikely to be replaced by the U.S. Forest Service. If you would like to hike to Lonesome Lake, the Lonesome Lake Trail from the Lafayette Campground is the preferred route. 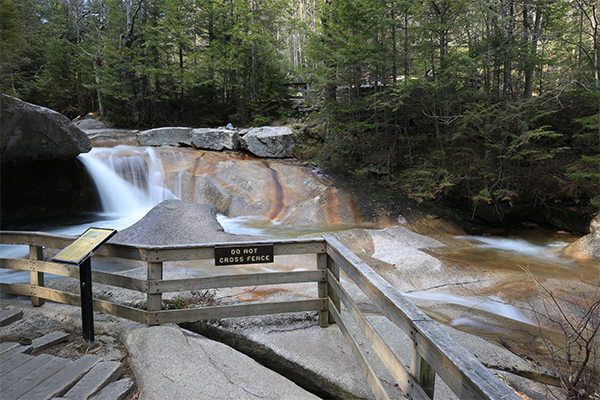 Although this does not affect any of the waterfalls themselves, the bridge above the uppermost falls on this trail (Rocky Glen Falls) was damaged and later removed. I do not recommend using this trail to visit Lonesome Lake as it would be difficult or potentially dangerous to cross the river without the bridge in place. 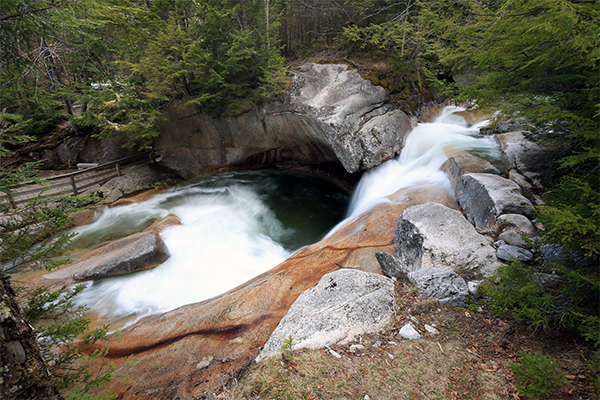 It is possible that the White Mountain National Forest may never replace this bridge as the potential for it getting destroyed again is too great.